Background Owing to lack of indicators, researchers are compelled to use non-specific indicators to assess rational use of medicines in children. Thus, paediatric-specific issues are poorly described. This study aims to develop a set of indicators to describe rational use of oral dosage forms of medicines given to children. Methods A modified RAND/UCLA Appropriateness Method was used. A comprehensive draft list of 40 indicators was compiled, based on the results of a literature review. Twelve experts rated these indicators in two rounds, using a nine-point Likert scale, first in an online survey, for clarity, necessity and scientific merit, and secondly in a face-to-face meeting, for necessity, feasibility and predictive value. An overall panel median score of ≥7 and agreement within the experts were used in indicators. The indicators were ranked independently by the research team and a final list of indicators was prepared. These indicators were pilot-tested for acceptability and interrater reliability. Results Nine prescribing indicators, such as weight, appropriate dose and age-appropriate dosage form; five dispensing indicators, such as adequacy of labelling and inappropriate manipulation by pharmacists; and five administration indicators, such as inappropriate manipulation by parents and full completion of dose, were finalized in the second round. Conclusion This novel approach has provided a set of indicators to describe the use of oral dosage forms of medicines given to children, which can be used by researchers as a supplement to the World Health Organization’s drug use indicators when investigating rational use of medicines in children. The World Health Organization (WHO) defines rational use of medicine (RUM) as patients receiving “medicines appropriate to their clinical needs, in doses that meet their own individual requirements, for an adequate period of time, and at the lowest cost to them and their community”. RUM reduces risks, improve benefits, saves money, prevents wastage of resources and helps equity. It is not limited to selecting the right medicine, but it also involves selecting the right dose, dosage form, route of administration, dosing interval and duration of treatment. Appropriate prescribing, dispensing and administration practices are core components in ensuring RUM. WHO encourages its Member States to establish programmes to promote RUM. The first step in promoting any strategy is to assess the current situation. Difficulties in measuring RUM quantitatively prompted WHO to develop core and complementary drug use indicators to measure use of medicines. Many researchers worldwide have used the WHO drug use indicators to describe RUM. These drug use indicators are “time-tested” over three decades and have been found by researchers to be useful, user-friendly, reproducible, valid, reliable and applicable to multiple settings, and can be used with limited data and by individuals who are not specifically trained. One drawback of the WHO drug use indicators is that their generic nature means they were designed neither to measure RUM in a particular age group or special population, nor to describe the potential challenges for RUM in those groups. This is a major limitation in employing the WHO drug use indicators alone to measure RUM in a paediatric age group. RUM in children has many distinctive challenges, not least because children are not just small adults. It is not limited to selecting the suitable medicine for the child but also extends to selecting the appropriate dose and suitable dosage form. In addition, administering medicines to children poses special challenges. The generic WHO drug use indicators cannot identify the unique challenges in paediatric pharmacotherapy, as they lack the ability to assess the issues related to dose, dosage form, administration, palatability and acceptability: all of these are key obstacles for RUM in children. While paediatric studies using the WHO indicators have described generic issues related to medicine use in children, they have failed to identify the specific challenges for RUM in this population. These challenges are most notable for oral dosage forms of medicines, owing to the overall lack of “child size” medicines and suitable paediatric dosage forms. Medicine use is rational (appropriate, proper, correct) when patients receive the appropriate medicines, in doses that meet their own individual requirements, for an adequate period of time, and at the lowest cost both to them and to the community. Irrational (inappropriate, improper, incorrect) use of medicines is when one or more of these conditions is not met. To be effective in children, medicines must be available in formulations that allow doses to be easily adjusted to reflect a child’s size, stage of development and condition. The lack of availability of medicines that fit these criteria for children is a major reason for irrational practices. Examples include splitting tablets or opening capsules and estimating the dose to be administered. To the best of the authors’ knowledge, there are no indicators for RUM in children in the world literature. Hence, the objective of this study was to develop a set of indicators to measure RUM of oral dosage forms of medicines given to children. The RAND/UCLA Appropriateness Method was employed to develop the indicators. This method depends on finding the most appropriate indicators for conditions that cannot be measured by numerical scale. Unlike the Delphi method, which involves multiple questionnaire-driven rounds to obtain the opinion, the RAND/UCLA Appropriateness Method involves a round of individual rating, followed by a round of face-to-face discussion with experts. It is the only systematic method of combining expert opinion and evidence, as well as having inter-panellist discussion. A literature review is done and sent to the panellists so they can base their opinion on scientific evidence. This method has also been shown to have predictive, face and content validities, and a high level of reproducibility. It also includes a rating of the feasibility of collecting data, a key requirement in the application of indicators. The design comprises two key components: (i) identification of indicators; and (ii) a two-round consensus process. As described in best practice documents for the RAND/UCLA Appropriateness Method, a literature review was conducted to locate articles on use of oral dosage forms of medicines in children. The key research questions used as the basis for developing the search strategy for the literature review were: (i) what are the irrational ways of prescribing, dispensing and administering oral dosage forms of medicines to children? ; (ii) what is the level, nature and quality of the research evidence for drug manipulations at the point of prescribing, dispensing and administration of oral dosage forms? ; (iii) what are the effects of prescribing adult oral dosage forms to children? ; and (iv) what are the effects of manipulating oral dosage forms, using methods employed at the point of drug dispensing and administration, on dose accuracy, palatability, bioavailability and stability? In the context of this project, “irrational” practices were defined as manipulation of oral dosage forms of medicines for children, such that they are inappropriately, improperly or incorrectly prescribed, dispensed or administered. The word “irrational” therefore does not reflect on an individual’s action but is used as a general term to contrast with “rational” use of medicines. All type of articles published in English between January 1985 and January 2016 on children aged ≤12 years were eligible. Based on the research questions, the search terms, including their synonyms and spelling variants, were: “child”, “infant”, “paediatrics”, “paediatric”, “baby”, “pharmacist”, “nurse”, “doctor”, “health-care professional”, “parent”, “guardian”, “drug formulation”, “drug manipulation”, “splitting”, “opening”, “dosage form”, “crushing and dispersing oral solid dosage forms”, “oral drug”, “tablet”, “capsule”, “syrup”, “solution”, “suspension”, “dispensing”, “prescribing”, “administration”, “organoleptic properties”, “swallowing”, “refuse acceptability”, “taste”, “palatability”, “flavour”; “administration devices”, “droppers”, “oral/enteral syringes”, “measuring cups”, “measuring spoons”, “household spoons”, “irrational use”, “patient compliance”, “treatment refusal”, “stability”, “rational use”, “quality”, “bioavailability”, “safety”, “indicators” and “side-effect”. Multiple alternative search terms joined by the Boolean operators “OR” and “AND” were built up to search for articles in PubMed and Scopus. “OR” exploded the search and marked it highly sensitive. Using “AND” at the end of the process narrowed the search. Titles and abstracts were screened initially to identify all English-language guidelines, reports and articles on oral dosage forms of any drug in children. Duplicate studies were identified and deleted. When studies met the inclusion criteria or when a decision to include a study could not be made based solely on review of the title or abstract, full-text copies were obtained. Selected full-text articles were carefully reviewed to identify the articles that were aimed at answering the key questions. As per the RAND/UCLA-recommended good practices, the first author extracted all relevant information from the articles and summarized the literature search with links to full articles (or the print version of full articles) for the expert panel. From these data, the first draft of indicators to measure rational use of oral dosage forms of medicines in children was developed by the authors, after several rounds of discussion. The indicators were grouped into three categories, namely prescribing, dispensing and administration. A multidisciplinary panel of 12 experts, in the fields of clinical pharmacology, pharmacology, paediatrics, pharmacy, nursing and community medicine were selected. The local experts (n = 10) were nominated by relevant postgraduate institutes and societies; the international experts (n = 2) were selected by writing to experts in the field. Rating forms using a nine-point Likert scale were prepared to assess the clarity, necessity and scientific merit (see [Table 1]) of each indicator in the first draft. These were converted to an online form using Survey Monkey. The following were sent to the panellists: (i) a rating form for the list of indicators; (ii) instructions for rating; (iii) a summary of the literature review; (iv) a detailed summary of articles with citations; and (v) a covering letter that explained the purpose, process and outcomes of the study. Before the meeting, panellists were given a personalized form giving the panellist’s own rating and the rating by the panel as a group. During the meeting, panellists discussed each indicator in terms of given criteria. After the discussion, panellists independently rated feasibility and predictive value and re-rated necessity on a nine-point Likert scale (see [Table 1]). Rates given by the panellists for the five criteria, namely clarity, necessity, scientific merit, predictive value and feasibility, were computed and the median score for each criterion was calculated. When the overall panel median score was ≥7 for all criteria, with agreement within the panellists, and when no more than two panel members rated the statement outside a three-point distribution around the median for any of the criteria, the indicators were considered as appropriate.These selected indicators were subjected to further scrutiny by the authors. Similar to the WHO drug use indicators, the authors decided to limit the indicators of each category to fewer than 10. The research team ranked the important indicators independently and the final list of indicators was prepared. Open comments made by the experts were also taken into consideration when the final list was prepared. As per the method adopted, this list of indicators satisfies content validity, predictive value, reproducibility, feasibility, necessity and clarity. To refine the finalized list further, the indicators were also tested for acceptability, defined as whether “the indicator is acceptable to both those being assessed and those undertaking the assessment”. Since these indicators will be administered by researchers, prescribers, pharmacists and parents, eight participants were selected from each category. For the professionals, selection was via nominations from the postgraduate institute/society. The parents were selected with the help of the in-charge medical officer of a child welfare clinic. Participants were given rating forms with the Likert scale of 1–9 and were requested to rate relevant indicators for acceptability (score of 1–3 not accepted; 4–6 uncertain acceptability; and 7–9 acceptable). When participants’ scores were analysed, indicators with a median score of less than 7 and indicators with non-agreement (2 members marking 3 points away from the median) were either removed or amended. In order to apply in health-care settings, the indicators were converted to user-friendly interviewer-administered data-collection instruments, mainly in the form of checklists and data-collection sheets. The data-collection instruments and the measurement of indicators were pretested in a paediatric ward, clinic and outpatient department of a teaching hospital, to determine whether they allow calculation of all the indicators and user-friendliness. Information for prescribing and dispensing indicators were collected from patients’ records; for administration, indicators were collected via interviews with parents. Interrater reliability was also assessed during this pilot study. Interrater reliability was defined as the relative consistency of the judgements that are made of the same stimulus by two or more raters. In order to determine interrater reliability, two raters independently reviewed each indicator in the records of children who were given oral dosage forms of medicines in the study setting during the pilot study. Cohen’s kappa was calculated to determine the interrater reliability. A kappa value above 0.7 was considered as good agreement. Minor amendments were made to the data-collection instruments and indicators. Since the set of indicators will be unique in identifying different issues in paediatric prescribing, dispensing and administration practice, it was decided to leave them as stand-alone indicators similar to WHO drug use indicators, rather than scoring each indicator and determining a cut-off value. This concluded assessment of the validity of indicators. Ethical approval was obtained from the Ethics Review Committee, Faculty of Medicine, University of Colombo, Sri Lanka. Parental informed consent and assent from children were obtained. Paediatric clinical pharmacology is a relatively new discipline, and thus there were relatively few reports of problems of oral dosage forms in children. There were no existing indicators in the literature for measurement of RUM in children. There were 1229 publications on the theme of challenges faced by children in RUM, mostly around issues of prescribing, dispensing and administration. Of the 80 records identified as being relevant to answering the key questions, 66 were journal articles and 14 were guidelines/reports. The full details of the results of the literature review, as presented to the expert panel, are available on request from the corresponding author. The results, which were grouped into 12 topics, are summarized in [Box 1]. Since no existing indicators that could be used as a template were found, the authors developed 14 prescribing, 11 dispensing and 15 administration indicators, based on the results of the literature review. The 40 draft indicators appear in [Box 2]. All 12 experts participated in the first-round online survey. Seven of the 12 panellists attended the second-round face-to-face meeting. Of the five panellists who could not attend the face-to-face meeting, two international experts contributed to the process electronically and rated the indicators through an online survey and another two were met on a different day by the research team; one panellist did not participate in round two. In round one, the 40 draft indicators were graded by the expert panel in terms of clarity, necessity and scientific merit. The expert panel considered all of them appropriate to assess rational use of oral dosage forms of medicines in children (overall panel median rating of 7–9 with agreement). In the second-round, face-to-face meeting, the 40 indicators were graded by the expert panel in terms of feasibility and predictive value, and regraded in terms of necessity. Again, the panel rated all indicators as appropriate (median score ≥7 with none marked 3 points away from the median), but it noted several instances where several indicators on the same theme could be consolidated into a single overarching indicator. The panel also recommended the way in which indicators could be rephrased. After consolidating groups of indicators on the same themes and incorporating the suggested rephrasing, 19 indicators were finalized. The logistics of applying the indicators in health-care facilities were also taken into consideration when compiling the final list of nine prescribing, five dispensing and five administration indicators to measure rational use of oral dosage forms of medicines for children (see [Table 2]). Each of the 19 indicators in the finalized list was scored as acceptable (median ≥7) in each group of participants: researchers, prescribers, pharmacists and parents. The data-collection instruments were used by the first author to collect data on 30 instances of prescribing, dispensing and administration of oral dosage forms of medicines in 20 children in a paediatric ward, clinic or outpatient department of a teaching hospital. It was found that numerators and denominators could be readily obtained, allowing efficient calculation of all indicators. The records of the 20 children who were given 30 oral dosage forms of medicines from the pretesting were reviewed independently by the first author and an independent rater. The kappa value was above 0.7, indicating high agreement between the two raters. The finalized list of the indicators, their purpose and the numerator and denominator for the calculation of each are given in [Table 2]. This study followed an extensive well-tested process to develop indicators to describe the use of oral dosage forms of medicines given to children. To the best of the authors’ knowledge, this is the first time that a set of evidence-based indicators has been developed to measure rational use of oral dosage forms of medicines in children. Since the WHO core drug use indicators are generic, their use will detect broad issues of RUM in children that are common to RUM in adults. We therefore suggest that the indicators from this study can serve as supplementary indicators to the WHO core indicators. 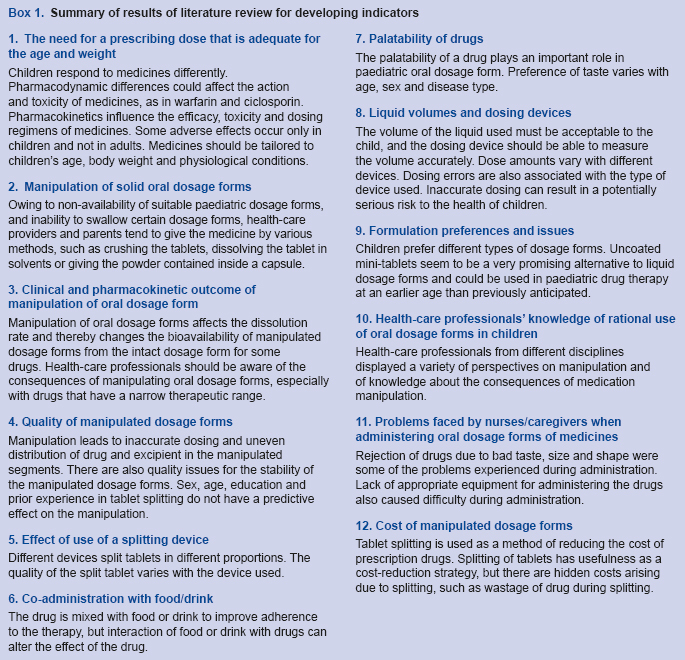 Researchers interested in rational use of oral dosage forms of medicines in children should also consider using these supplementary indicators. These indicators will be useful for researchers, paediatricians, clinical pharmacologists, clinical pharmacists, medical administrators and policy-makers. They can be used at a national, regional, hospital or even ward level, to understand the issues in rational use of oral dosage forms of medicines in children. The indicators will allow quantification of the issue, as well as determining the type of irrational use, finding out the reasons and explaining the contributing factors. This will facilitate implementation of interventions to improve the existing practice, if it is deficient, and reassessment after some time to measure the outcome of implementation. The indicators cover the entire cycle of medicine issues in children, namely prescribing, dispensing and administration. Since they are stand-alone indicators, researchers can use a particular group of indicators that are relevant to them; for example, the chief pharmacist of a hospital can use dispensing indicators to investigate issues related to dispensing practices. It is interesting to note that almost all the prescribing indicators are related to dosing of medicines in children. In addition, the majority of articles identified during the literature review related to prescribing and dosing accuracy in children. It is the authors’ perception that awareness of the need “to scale the dose to function and not to size” and that “one size does not fit all” is quite high in Sri Lanka, and this may also be true of other resource-limited settings. This may be the result of initiatives such as the WHO campaign “Make medicines child size”, which was launched in 2007 to raise awareness of and accelerate action to meet the need for improved availability and access to child-specific medicines. Given the expertise and up-to-date knowledge of the expert panel, it is unsurprising that this issue was strongly represented. The need to ensure appropriate administration of medicines to children has become more represented in the published literature in recent years. Most of the publications are from resource-rich countries, with few from resource-limited countries. It is a relatively new topic for many resource-limited countries, which are struggling to improve the availability and affordability of medicines for children. However, the acceptability of medicines is also a component in access to medicines. Even if affordable medicines are made available, the objective of treatment can be met only if the medicines are given to children properly. Hence, the set of administration indicators will be a useful tool to assess this neglected area of rational use of oral dosage forms of medicines in children in resource-limited countries. The indicators mainly focus on issues in administration, which may lead to dosing errors. Since antibacterial agents are the commonly prescribed medicines in children, dosing errors have many implications, including emergence and spread of antibiotic resistance. Interestingly, all 40 indicators developed by the authors were found to be appropriate in terms of feasibility, necessity and predictive value. The number of indicators remained the same even after two rounds of expert review. This could be due to the extensive search done by the authors before developing the initial set of indicators and shortlisting to 40 indicators from a longer list. Since the authors also represent the same expertise as the panel members, it is perhaps unsurprising that the panellists found all 40 shortlisted indicators appropriate. The authors nevertheless reduced the number of indicators to 19, considering the time required to complete the data-collection form; this was aided by open comments given by the panellists and consolidating indicators, which were variations of the same theme. Finally, these indicators are not meant to measure the appropriateness of prescribed medicines for children. They were developed for health-care settings; further validation is needed if they are to be used in the community setting. This study developed a set of indicators to measure rational use of oral dosage forms of medicines in children, using a standard method. The indicators satisfied the criteria for appropriateness. They can be used together with the WHO drug use indicators to identify issues in rational use of oral dosage forms of medicine in children. Acknowledgements: The authors thanks the expert panel members for their participation in the development of the indicators. Source of support: University Grants Commision, Sri Lanka. Grant No: UGC/DRIC/PG/2015(ii)/SJP/01. Authorship: All authors were involved in the research conception. AN was responsible for data acquisition and analysis and, with SSR, for manuscript preparation; GS and AP read the manuscript and provided comments for improvement; SSR gave final approval for the manuscript. The rational use of drugs. Report of the conference of experts, Nairobi, 25–29 November 1985. Geneva: World Health Organization; 1985 (http://apps.who.int/medicinedocs/documents/s17054e/s17054e.pdf, accessed 20 February 2019). World Council of Churches. Promoting rational use of medicines. Contact. 2006;October–December (http://apps.who.int/medicinedocs/documents/s19836en/s19836en.pdf, accessed 20 February 2019). Holloway K, Dijk VL. The world medicines situation 2011, 3rd ed. Rational use of medicines. Geneva: World Health Organization; 2011 (WHO/EMP/MIE/2011.2.2; http://www.who.int/medicines/areas/policy/world_medicines_situation/WMS_ch14_wRational.pdf, accessed 20 February 2019). MDS-3: managing access to medicines and health technologies. Arlington (VA): Management Sciences for Health, Inc.; 2012 (http://apps.who.int/medicinedocs/documents/s19577en/s19577en.pdf, accessed 20 February 2019). Promoting rational use of medicines: core components. Geneva: World Health Organization; 2002 (WHO Policy Perspectives on Medicines, No. 5; http://apps.who.int/medicinedocs/pdf/h3011e/h3011e.pdf, accessed 20 February 2019). Karande S, Sankhe P, Kulkarni M. Patterns of prescription and drug dispensing. Indian J Pediatr. 2005;72:117–21. Nguyen HT, Wirtz VJ, Haaijer Ruskamp FM, Taxis K. Indicators of quality use of medicines in South East Asian countries: a systematic review. Trop Med Int Health. 2012;17:1552–66. doi:10.1111/j.1365-3156.2012.03081.x. How to investigate drug use in health facilities: selected drug use indicators. Action Programme on Essential Drugs. Geneva: World Health Organization; 1993 (WHO/DAP/93.1; http://apps.who.int/medicinedocs/pdf/s2289e/s2289e.pdf, accessed 20 February 2019). Koren G. Special aspects of perinatal and paediatric pharmacology. In: Katzung BG, Trevor AJ, editors. Basic and clinical pharmacology, 11th ed. New York: McGraw-Hill; 2007:1025–36. Ghaleb AM, Barber N, Franklin BD, Kei Wong IC. 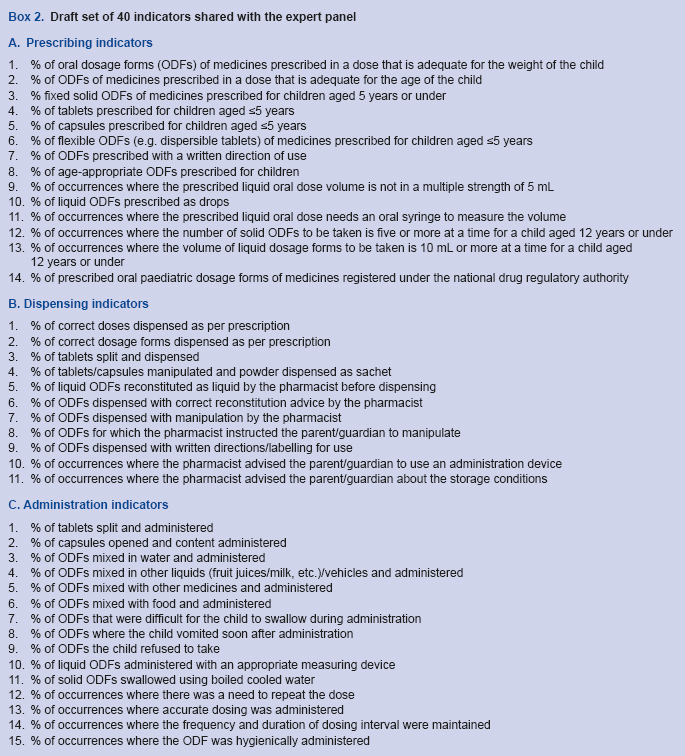 The incidence and nature of prescribing and medication errors in paediatric inpatients. Arch Dis Child. 2010;95:113–18. doi:10.1136/adc.2009.158485. Ivanovska V, Rademaker CM, van Dijk L, Mantel-Teeuwisse AK. Pediatric drug formulations: a review of challenges and progress. Pediatrics. 2014;134(2):361–72. doi:10.1542/peds.2013-3225. Fitch K, Bernstein SJ, Aguilar MD, Burnand B, LaCalle JR, Lazaro P et al. The RAND/UCLA Appropriateness Method user’s manual. Santa Monica (CA): RAND Corporation; 2001 (https://www.rand.org/pubs/monograph_reports/MR1269.html, accessed 20 February 2019). Naylor CD. What is appropriate care? N Engl J Med. 1998;338:1918–20. doi:10.1056/NEJM199806253382612. Shekelle PG, Kahan JP, Bernstein SJ, Leape LL, Kamberg CJ, Park RE. The reproducibility of a method to identify the overuse and underuse of medical procedures. N Engl J Med. 1998;338:1888–95. doi:10.1056/nejm199806253382607. Lawson EH, Gibbons MM, Ko CY, Shekelle PG. The appropriateness method has acceptable reliability and validity for assessing overuse and underuse of surgical procedures. J Clin Epidemiol. 2012;65:1133–43. doi:10.1016/j.jclin epi.2012.07.002. SurveyMonkey (www.surveymonkey.com, accessed 20 February 2019). Campbell SM, Braspenning J, Hutchinson A, Marshall M. Research methods used in developing and applying quality indicators in primary care. Qual Saf Health Care. 2002;11:358–64. doi:10.1136/qhc.11.4.358. Lavrakas PJ. Encyclopedia of survey research methods. Thousand Oaks (CA): Sage Publications, Inc.; 2008. doi:10.4135/9781412963947. McHugh ML. Interrater reliability: the kappa statistic. Biochem Med (Zagreb). 2012;22:276–82. Finney E. Children’s medicines: a situational analysis. Geneva: World Health Organization; 2011 (http://apps.who.int/medicinedocs/documents/s20020en/s20020en.pdf, accessed 20 February 2019). Balasubramaniam R, Beneragama BV, Sri Ranganathan S. A national survey of availability of key essential medicines for children in Sri Lanka. Ceylon Med J. 2011;56:101–7. doi:10.4038/cmj.v56i3.3597. Van Riet-Nales DA, Ferreira JA, Schobben AF, de Neef BJ, Egberts TC, Rademaker CM. Methods of administering oral formulations and child acceptability. Int J Pharm. 2015;491(1–2):261–7. doi:10.1016/j.ijpharm.2015.06.047. Adams LV, Craig SR, Mmbaga EJ, Naburi H, Lahey T, Nutt CT et al. Children’s medicines in Tanzania: a national survey of administration practices and preferences. PLoS One. 2013;8(3):e58303. doi:10.1371/journal.pone.0058303. Liu F, Ranmal S, Batchelor HK, Orlu-Gul M, Ernest TB, Thomas IW et.al. Formulation factors affecting acceptability of oral medicines in children. Int J Pharm. 2015;492(1–2):341–3. doi:10.1016/j.ijpharm.2015.05.013. Risk R, Naismith H, Burnett A, Moore SE, Cham M, Unger S. Rational prescribing in paediatrics in a resource-limited setting. Arch Dis Child. 2013;98(7):503–9. doi:10.1136/archdischild-2012-302987. Al-Ramahi R, Hmedat B, Alnjajrah E, Manasrah I, Radwan I, Alkhatib M. Medication dosing errors and associated factors in hospitalized pediatric patients from the South Area of the West Bank – Palestine. Saudi Pharm J. 2017;25(6):857–60. doi:10.1016/j.jsps.2017.01.001.